Incorporating ground-breaking and time-tested techniques, this book shows readers that they too can boast a vocabulary that impresses their peers. 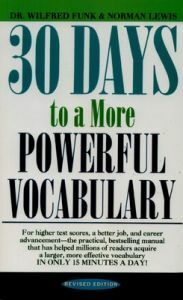 In its nearly 40 years of print history, this book has shown millions of readers how they can build a large vocabulary using just 15 minutes a day for 30 days. In a month readers will not only possess a remarkable vocabulary but also learn the etymology of words, retaining these words throughout their lives. Readers will be left with a spellbinding vocabulary that improves their oratory skills. In 30 days they will be able to understand hitherto difficult words faster, easier and remember their meanings for a long time to come through incorporating them into daily usage. This book will help readers throughout their lives and will be an essential part of their library for years to come. Norman Lewis was an American grammarian, writer, lexicographer and etymologist. He is best remembered as the author of Word Power Made Easy, How to Read Better and Faster, Correct Spelling Made Easy and Dictionary of Pronunciation. Wilfred Funk was an American poet, author, lexicographer and publisher. He is known as the author of The Way to Vocabulary Power and Culture, Six Weeks to Words of Power, 25 Magic Steps to Word Power and The Way to Vocabulary Power and Culture.